it's been a while since i did a list (sorry!) but i've been busy. and so has moorea seal; she's been lagging a little behind, and i've taken that to mean that i can i lag behind too. my apologies. 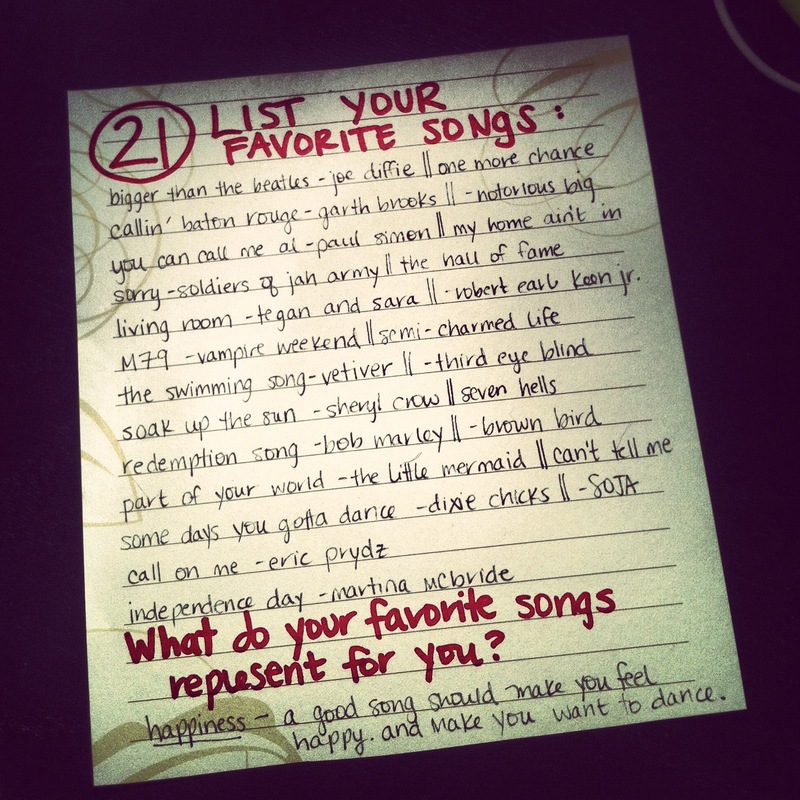 but week 21's prompt is an interesting one, mainly because we've already made a list about music. in week 8 i wrote about my favorite albums. i talked about how i chose my favorite albums based on the ones that meant something to me, the ones that were poignant to a certain time in my life. but i also mentioned how difficult it can be to find a whole album of awesome songs. so this list is similar and different to week 8's list. it's similar in that the songs mean something to me, they were somehow significant in my life, but it's different in that the songs are from a plethora of albums, some of which are complete duds except for the song i chose. 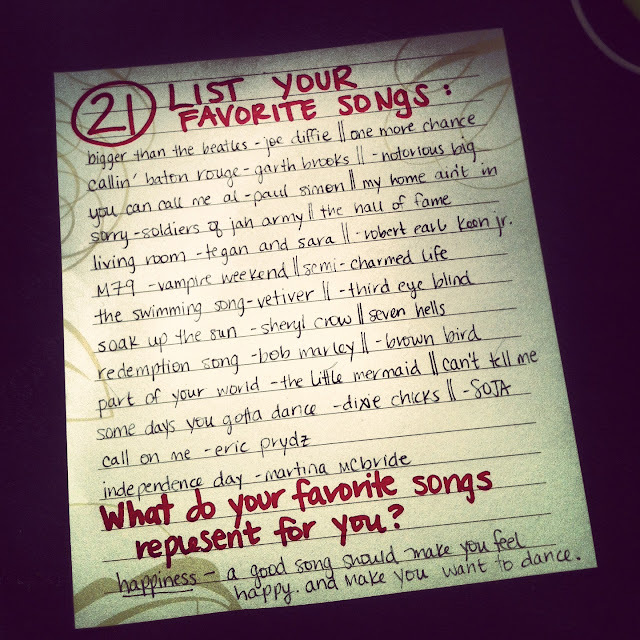 or the songs were chosen because of how happy and awesome they make me feel. for example, soak up the sun by sheryl crow -- it reminds me of driving to track practice in high school, the windows were down, the music was turned up, and my friends and i were dancing as we drove, making the cars next to us uncomfortable. or call on me by eric prydz, which reminds me of my second year of college living in england. or even part of your world from the little mermaid, a song i listened to on repeat for eight years as a child. but the one thing that all of these songs have in common is that they make me happy; they remind me of happy days gone by and of happy ones to come. and they make me want to dance. and dancing too, makes me happy. what song(s) do you love?